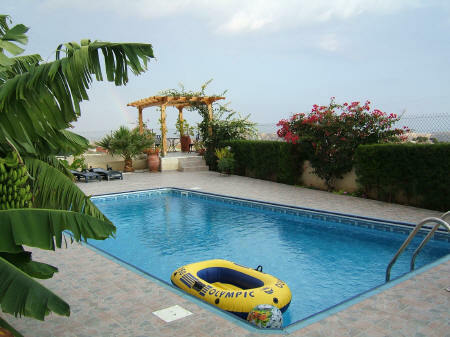 Berengaria is a modern luxurious villa It is a spacious and well-equipped 3 bedroom luxury villa, with full air-conditioning, WiFi and a private swimming pool with a large garden area. Berengaria enjoys a quiet location with splendid views of the vineyards and Pissouri village (and the sea in the distance). 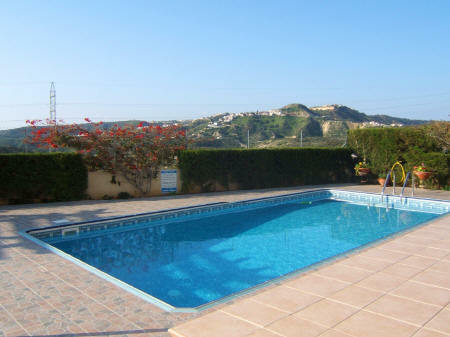 The villa is located 3 km from Pissouri village and 4 km from Pissouri Bay (less than 4 minutes drive to both). Golf enthusiasts can also take advantage of the 2 golf courses, Aphrodite Hills and Secret Valley, less than a 10 minute drive away. The 3 spacious double bedrooms, 2 bathrooms (+ extra WC) and large living space makes Villa Berengaria an ideal location to relax in quiet surroundings. 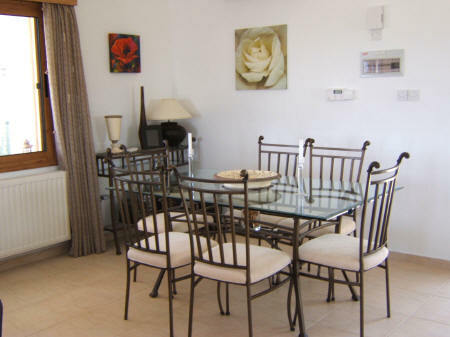 The villa is furnished to an exceptionally high standard as the UK owners stay here regularly and therefore it’s a strictly non-smoking and pet free villa. Both a cot & high chair are available without extra charge. The villa has air conditioning. 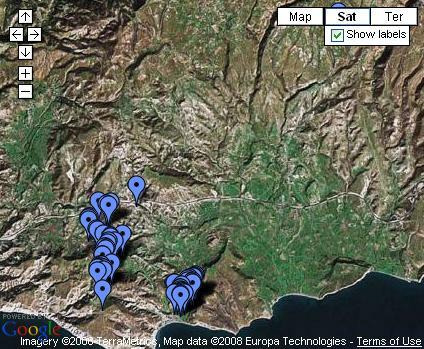 The A/C units fitted in all the bedrooms do not have timers fitted and can be used as required. The a/c unit in the lounge is fitted with a 2 hour timer, but it can be switched on again for another 2 hours at the end of each period. A welcome pack containing some essentials is provided. Upstairs bedrooms: 3 bedrooms (1 double and 2 twin) all with fitted wardrobes, dressing tables, air-conditioning and balconies. All bedrooms have bedside lamps, digital clocks and hairdryers. All the double glazed windows and sliding doors in the villa are fitted with insect screens to allow the fresh air to circulate when required. Bedroom 1 has a king-size bed and an en suite shower room. This bedroom has a private balcony and shares a very large one with bedroom 2. The balconies overlook the pool, vineyards and the sea. 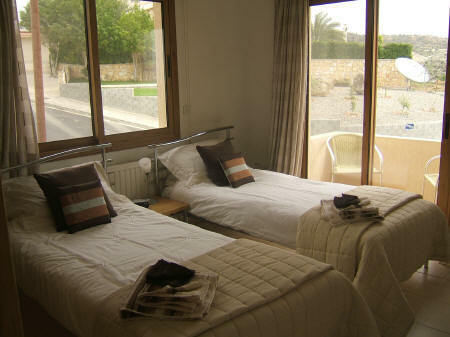 Bedroom 2 & 3 both have twin beds and balconies overlooking the local countryside. These share a second bathroom. The downstairs is again air-conditioned. Kitchen: Kitchen with fitted cupboards, electric touch control hob, electric oven, dishwasher, microwave, kettle, toaster, coffee maker, iron & board, washing machine & an American style fridge freezer. 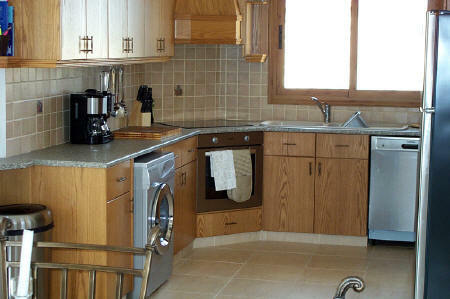 The kitchen is well equipped with everything you will need for your holiday. Dining Area: Glass dining table and 6 chairs, glass side console table holding a stereo system. Lounge area: Two comfortable leather settees, glass coffee table, flat screen TV with satellite featuring English-speaking channels including CNN, BBC Prime, BBC News, children's, sports and film channels. There is also a DVD player. 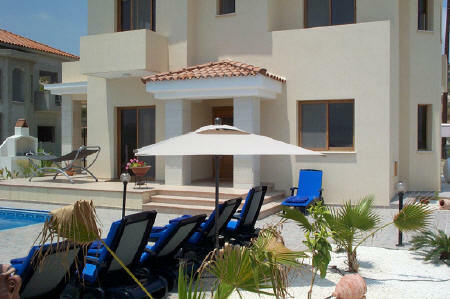 The villa is equipped with some DVD’s, CD’s, books and games for use during your holiday. There are two sets of patio doors opening onto the poolside and the outside eating area, with views of the pool, garden and countryside. Lounge area two. 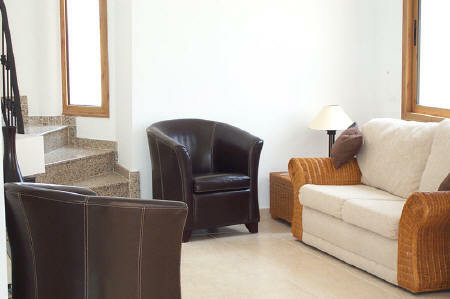 A quiet corner with a double wicker settee, i-pod docking station, two leather chairs, a glass and a wicker coffee table. Outside: The private swimming pool is cleaned & maintained twice a week and is surrounded by a patio area. The poolside is well equipped with 6 sun loungers, garden furniture, a parasol, barbecue and outdoor lighting for the evenings. The garden has been professionally landscaped during 2005 and is planted with exotic plants, palms, banana, colourful bougainvillea, lemon trees and a small orange tree. There is a private drive with a carport should you choose to park your car underneath its shade. The garden has a Pergola which has two chairs and a table underneath. 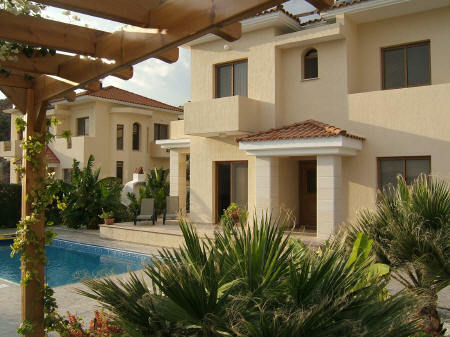 It overlooks the old Paphos road, vineyards, and bay. There is a BBQ built in the garden. Either wood or charcoal can be used as fuel. 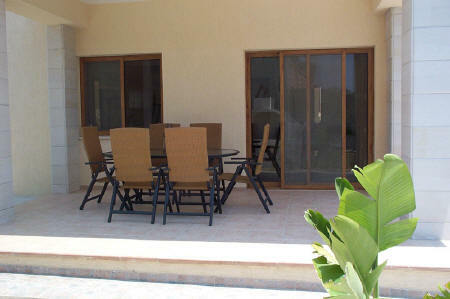 The outside dining area consists of a glass table with 6 chairs and is under cover from the midday sun. Rental includes linen, towels and a welcome hamper including coffee, tea, bread, butter, milk and juice. Pool or beach towels are not included: please bring your own. Air-conditioning or heating, as required, is included in the price. Payment - a 25% deposit on booking, balance a minimum of 6 weeks before departure. *Note: the rate charged will be pro-rata, so that bookings that span two calendar months will depend on the number of days booked in each month.